A federal appeals court Sunday night denied a Native American tribe's request for an injunction to block construction of a four-state crude oil pipeline that tribal leaders say threatens their water supply and traverses culturally sacred sites. The ruling means that construction on the 1,172-mile Dakota Access Pipeline can continue near the Standing Rock Sioux Tribe's reservation in North Dakota, but the tribe vowed to continue its campaign against the pipeline. The U.S. Court of Appeals for the D.C. Circuit quietly issued its ruling in the evening hours on the night before Columbus Day, a federal holiday that many indigenous groups find offensive and some states refer to as "Indigenous People's Day." In the ruling, the judges appeared sympathetic to the plight of the Standing Rock Sioux Tribe, despite denying the tribe's request, stating that although they are giving the green light to construction of the pipeline, "ours is not the final word." Despite the judge's ruling Sunday night, Dave Archambault II, chairman of the Standing Rock Sioux Tribe, told ABC News that his people will not back down. "I was, of course, disappointed," Archambault said, though adding that "we are going to continue to fight. We will look at all of our legal options moving forward." The judges even went on to say "we can only hope the spirit of Section 106 may yet prevail," referring to a section of the National Historic Preservation Act that requires federal agencies to take into account effects on historic properties and gives the Advisory Council on Historic Preservation an opportunity to comment. The tribe is studying its legal options. Other than the small area near the reservation, the pipeline is nearly complete, according to The Associated Press. Archambault said he is appreciative of the people from across the country who have supported the Standing Rock Sioux Tribe. "I just can't say enough, I appreciate all of the support, and I am so thankful that they recognize what is going on here," Archambault told ABC News. "It is a very simple concept, we are protecting the water, we are protecting our sacred spaces, for our children and their children who aren't even born yet." In a statement issued Sunday after the ruling, Archambault said that "We are guided by prayer, and we will continue to fight for our people. We will not rest until our lands, people, waters and sacred places are permanently protected from this destructive pipeline." The battle to block the $3.7 billion crude oil pipeline built by Texas-based Energy Transfer Partners has waged on for months, garnering national attention and becoming the subject of one of the biggest Native American demonstrations in decades. 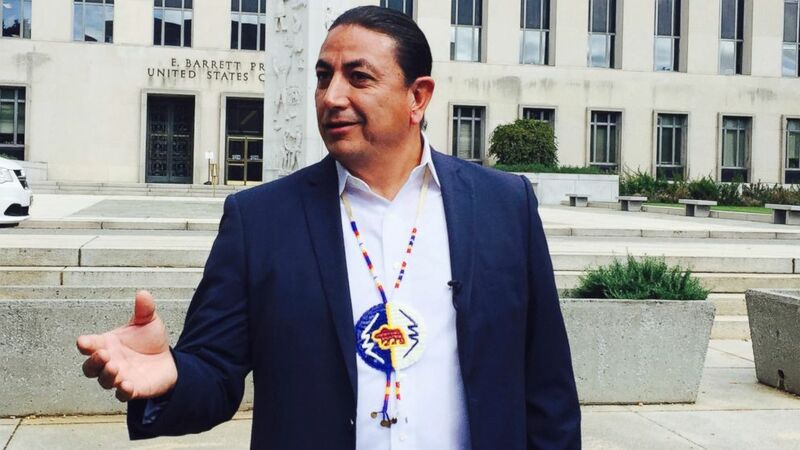 Jan Hasselman, the lead attorney for Earthjustice, the firm representing the tribe, said in a statement, "We call on Dakota access to heed the government's request to stand down around Lake Oahe." A federal judge last month denied the tribe's request to temporarily halt construction of the pipeline, but the Department of Justice, Department of the Army and Department of the Interior intervened in an unprecedented manner with a joint statement requesting "that the pipeline company voluntarily pause all construction activity within 20 miles east or west of Lake Oahe." Even President Obama weighed in on the movement to stop the pipeline at the White House Tribal Nations Conference last month, telling a crowd featuring more than 500 Native American leaders, "I know many of you have come together, across tribes and across the country, to support the community at Standing Rock and together you're making your voices heard." The fight against the pipeline began in July, when Standing Rock Sioux tribal leaders sued to block the pipeline through North Dakota, South Dakota, Iowa and Illinois. Tribal leaders claimed they were never meaningfully consulted before construction began. The pipeline ran through what they deemed to be culturally sacred sites and it presented a danger to the reservation's water supply, they argued. "We are pleased with the decision of the U.S. Court of Appeals to dissolve the administrative injunction that had temporarily suspended construction activities on the Dakota Access pipeline in an area near the proposed crossing of the Missouri River at Lake Oahe," Energy Transfer said in a statement following the ruling. "The decisions by two separate federal courts show that the U.S. Army Corps of Engineers acted with great care and followed the law with respect to the river crossing permits issued to Dakota Access." The company added that it "looks forward to a prompt resumption of construction activities east and west of Lake Oahe on private land."